The Arts Center of Coastal Carolina is putting on the glitz and glamour for the return of the Wine Auction Gala, this time with a Bacchus theme. The better-than-ever fundraiser returns to the Arts Center grounds, most recently held in 2011. Wine takes center stage on March 22 at the organization’s primary fundraiser, which supports a wide range of the Arts Center’s artistic and outreach programming. The evening begins at 5:30 p.m. with a cocktail reception and passed hors d’oeuvres, during the enticing silent auction. In the neighboring tent, wine will be served along with a gourmet dinner, graciously provided by The Westin Hilton Head Island Resort and Spa. But the highlight of the evening is the always fun and spirited live auction, where participants have a chance to acquire rare, collectible and extraordinary wines and lots. Even those who aren’t wine connoisseurs will enjoy the revelry, as two bars will be serving up a variety of spirits and craft beers as well as an additional Grey Goose bar. Among the lots featured in the live auction are cases of highly rated Bordeauxs, elegant Burgundies, Wine Spectator’s Top 50 Napa Cabs and Blends, a “Cult Wine” package with collectible reds, a Pride Mountains Claret Reserve Vertical, a First Growth Bordeaux package, which includes several bottles of Chateau Lafite-Rothschild and a 98-point Chateau Latour, Paulliac, an Opus One Vertical, as well as fabulous wine dinners and tastings. 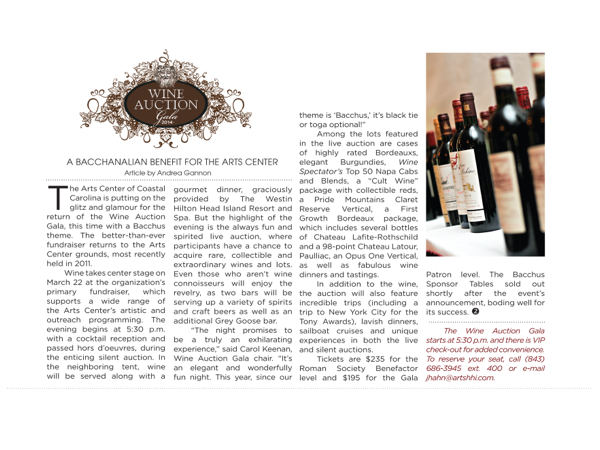 In addition to the wine, the auction will also feature incredible trips (including a trip to New York City for the Tony Awards), lavish dinners, sailboat cruises and unique experiences in both the live and silent auctions. The Wine Auction Gala starts at 5:30 p.m. and there is VIP check-out for added convenience. To reserve your seat, call (843) 686-3945 ext. 400 or e-mail jhahn@artshhi.com.